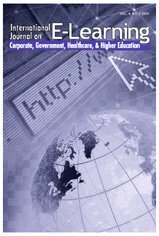 This case study briefly explores how an online, multimedia learning module based on a Cognitive Apprenticeship higher level pedagogy can positively affect students achieving the learning outcomes of a Constructivist project-based curriculum in a blended e-business management program in the Middle East. The cohort in this program is nonnative speakers of English and have significantly reduced life experience and independent learning opportunities relative to many of their international counterparts. The proposal of this endeavor is to support students prior to the start of the constructivist aspects of the project itself. This article attempts to answer the question, which type of support is effective in giving students the scaffolding they need for successful achievement of project learning outcomes without quelling the benefits of working in a constructivist learning paradigm. Results from the sample questioned reveal that such modules are useful for this cohort prior to the start of the group project work with the important caveat that instructors participate effectively in the online mentoring. Rush, A. (2008). The Design of Online Tertiary Courseware for a Blended Learning, Project-Based, E-Business Management Program in the Middle East. International Journal on E-Learning, 7 (4), 667-701. Waynesville, NC USA: Association for the Advancement of Computing in Education (AACE). Retrieved April 18, 2019 from https://www.learntechlib.org/primary/p/24305/. Chickering, A., & Ehrmann, S.C. (1996). Implementing the seven principles: Technology as lever. American Association for Higher Education Bulletin, 49(2), 3-6. Clark, R.E. (1994). Media will never influence learning. Educational Technology Research and Development, 42(2), 21-29. Jonassen, D. (1998). Designing constructivist learning environments. In C.M. Reiguluth (Ed. ), Instructional theories and models (2nd ed.). Mahwah, NJ: Lawrence Erlbaum. Kinshuk, Oppermann, R., Patel, A., & Kashihara, A. (1999). Multiple representation approach in multimedia based intelligent educational systems. Proceedings of the Artificial Intelligence in Education Conference (pp. 259-266). Amsterdam, The Netherlands: IOS Press. . Mayes, T., Dineen, F., McKendree, J., & Lee, J. (2001). Learning from watching others learn. In C. Steeples & C. Jones (Eds. ), Networked learning: Perspectives. London: Springer. Mayes, T., & Fowler, C. (1999). Learning technology and usability: A framework for understanding courseware. Interacting with Computers, 11, 485-497. Reigeluth, C.M. (1999). The elaboration theory: Guidance for scope and sequence decisions. In C.M. Reigeluth (Ed. ), Instructional-design theories and models: A new paradigm of instructional theory (Vol. II). Hillsdale, NJ: Lawrence Erlbaum. Reiser, B. (2002). Why scaffolding should sometimes make tasks more difficult for learners. Retrieved January 6, 2006, from http://citeseer.ist.psu.edu/rd/91793499%2C509222% 2C1%2C0.25%2CDownload/ http://citeseer.ist.psu.edu/cache/papers/cs/25944/http:zSzzSz Newmedia.colorado.eduzSzcsclzSz281.pdf/why-scaffolding-should-sometimes.pdf Savery, J.
Taylor, J.C. (2001, April). Fifth generation distance education. Keynote address presented at the 20th ICDE World Conference, Dusseldorf, Germany. Teles, L. (1993). Cognitive apprenticeship on global networks. In L. Harasim (Ed. ), Global networks: Computers and international communication (pp. 271-281). Cambridge, MA: MIT Press.